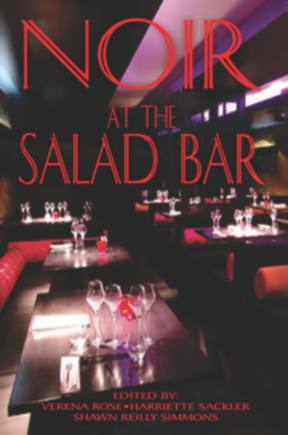 This story appeared in NOIR AT THE SALAD BAR, CULINARY TALES WITH A BITE, published by Level Best Books, July 2017. It all began with macadamia nuts. I’ll never forget how thrilled I was to have my yummy recipe for white chocolate chunk macadamia nut cookies included in What’s Cooking at Hillcrest Elementary School on the very same page as Mrs. Frederick Sillerton’s Krisp Kringles. True, I may have copied most, okay, all of the recipe from Betty Crocker’s Junior Cookbook. But I wasn’t alone. I’d noticed a recipe very much like Mrs. Sillerton’s on a package of Nestles semi-sweet chocolate bits. My lack of originality didn’t stop Ricky Harrison, a fifth-grade classmate on whom I had a huge crush, from inviting himself over for a sampling. Fortunately, my mom was there to take him to the Emergency Room when he broke out in hives, vomited and fainted. I felt bad he got sick, but I would have felt much worse if he hadn’t told me I was too fat to be his girlfriend just before he went into anaphylactic shock. It was an important learning experience for both of us. Ricky learned he was allergic to tree nuts like macadamias. I learned that certain foods could be lethal. Fast forward from the nineteen-fifties to the early sixties, and I still believed the way to a man’s heart was through his stomach. So did most of my classmates at Whately Prep for Girls. By then, we’d moved on from Betty Crocker to Julia Child. We were convinced we needed to get good grades so we could get into good colleges, where we’d find good husbands. We were equally convinced we had to master the art of French cooking as a sure-fire way of landing such hubbies. Since our private school didn’t offer Home Ec., we started holding cooking sessions at each other’s houses. It soon became apparent that while I could whip up a first-rate batch of cookies, my soufflés were a total flop. Instead of rising, they remained flat as pancakes. This was embarrassing enough without Ginny Collins, my arch rival at Whately, spreading the word far and wide until people at school started calling me Flopsy. What to do? An opportunity presented itself one afternoon when I and several other girls were trying out Julia Child’s recipe for chocolate soufflés at Ginny’s house. We’d reached the point in the recipe where it was time to fold stiffly-beaten egg whites into the chocolate egg yolk mixture when a carload of boys drove past, honking and waving. All the girls except me ran out of the house to get a better view and wave back. The boys circled the block three times, long enough for me to add a dash of Drano to Ginny’s chocolate mixture and join the others outside without anyone being the wiser. “I didn’t do a thing,” Ginny protested. “It was tampered with, and one of you is responsible.” She turned on us accusingly. One by one the girls denied it. When Ginny got to me, I said, “Not I . . . Noxy.” The others picked up the nickname, and Ginny fled the kitchen in tears. I was never called Flopsy again. Fast forward to the seventies, and instead of doing what was expected of me, I dropped out of college to join a commune in the wilds of Montana. It was headed by a charismatic man with piercing blue eyes, and long black flowing hair named Power Zenith. His real name, as I later found out, was Dwayne Yerkel. In the beginning commune life was fun. Everyone was friendly, we shared everything, and I liked living off the land. A farmer let us use a corner of one of his fields to plant crops, and we supplemented our diet by foraging in the woods. But after several months, things changed for the worse. The farmer kicked us off his land when some of our members were caught stealing his chickens and eggs, and we retreated into the mountains. Power Zenith went from being a benevolent despot to an outright tyrant. His word was law, and anyone who disobeyed him was punished. As his rule became more and more repressive, I began to look for a way out. But while it had been easy to join the commune, it was hard to leave, because no one was allowed to go anywhere without Power Z’s permission. I decided I had to put him out of commission long enough to make my escape. I couldn’t do it with macadamia nut cookies or a Drano-laced chocolate soufflé. What I could do was draw upon the knowledge of wild plants I’d gained while foraging. Having learned that various wildflowers were edible, I’d delighted my fellow commune members and Power Z himself with my blossom stir fries and tempuras. With his blessing, I went on a foraging trip. I returned with a veritable cornucopia of poison: buttercups, tall mountain larkspur, milkvetch, nightshade, spurge, and both mountain and meadow death camas. To prevent anyone from recognizing these as toxic plants, I covered them in batter and made one of my tantalizing tempuras. I arranged the crispy pieces of deep-fried flowers in our huge communal wok around a bowl of soy sauce. I briefly considered adding a dash of fuel oil to the sauce, but decided it would be overkill. Power Z always ate first. When I presented him with my pièce de résistance, he beamed with pleasure. “You’ve outdone yourself,” he said before digging in. I kowtowed my way out of the knot of followers surrounding him. Then I turned and ran. As I raced down the mountain, I could hear Power Z’s awful retching and ghastly screams. It took a while to get my life back on track after the commune fiasco. I finished college, married Mr. Right and had two children. By the mid-eighties, I was living in the Boston suburbs with every material comfort I could imagine. But I wasn’t happy. There was too much pressure to be perfect: perfect wife, perfect mom, perfect housekeeper, perfect hostess, and perfect cook. It was a time of intense competitive cooking, whether this involved preparing a gourmet meal for two, throwing a lavish dinner party for dozens of people, or baking the best-ever cookies for your child’s school’s PTA fund raiser. At first, I tried to meet these impossibly high culinary standards, but it was hard. My kids greeted the eggplant ratatouille and oatmeal soup I prepared for Sunday breakfast with gagging noises, and my husband was less than appreciative of my efforts. He’d say things like “Your braised rabbit with Chartreuse is decent, but not spectacular like Lily Gordon’s.” He made invidious comparisons like this so often that I began to wonder if he had roving eyes as well as a roving palate. Then one day a ghost from my gastronomic past walked back into my life when Ricky Harrison and his wife Louise moved into our suburban cul de sac. It fell to me to host the welcome-to-our-neighborhood party, a potluck in which everyone contributed a dish. I made my signature seven-greens salad with homemade creamy raspberry vinaigrette dressing. Others brought dishes that were also straight from The Silver Palate Cookbook. Everything was going swimmingly until I turned to Louise Harrison, and said in a voice that could be heard throughout the room: “I suppose Ricky told you about the time I nearly killed him with my macadamia nut cookies.” Why did I say that? The truth was I’d had it with striving for perfection. “I hope there aren’t nuts in any of the dishes here.” Louise glanced anxiously at the buffet table. “Fine,” I said, little dreaming he’d spend a good portion of his time at home canoodling with our next-door neighbor’s Swedish au pair. Six months later, we split up. He got the house and kids, and I used the hefty settlement I received to buy a condo in Cambridge close to Tout Pour La Table, the upscale kitchenware shop where I worked as a sales assistant. There, my knowledge of everything from spatulas to sauté pans served me well. I rose from sales assistant to assistant manager to general manager. I threw myself into the job. I showed up first thing in the morning and was often the last to leave at night. At this point, you may be wondering if he’d use dinner to hit on me. Wrong. Although George did take me to a very nice restaurant, he was the perfect gentleman throughout. And the more we talked, the more I realized how much we had in common despite a twenty-year difference in age. We had such a good time that we started having dinner almost every night. Soon we were spending weekends together as well. A widower and retired history professor at Harvard, George lived in a rambling Victorian in the Avon Hill neighborhood of Cambridge. We went for long walks, played with his two rescue dogs, curled up in his library with our books, and shopped for and prepared all our meals. Working side by side with George in the kitchen, I never felt the competitive pressure I’d felt during my marriage. If one of us made a mistake, we laughed it off and continued on. Seven months later, I sold my condo and moved in with George. After another seven months, we married. I’d worried marriage might change things between us, but it only made them better. I’d never been so happy. George’s health issues did bring some changes in our lives, however. He suffered two heart attacks, and after the second one, his doctor put him on a strict low-fat, low-cholesterol diet. This was hard for George, because he loved red meat and rich desserts. A diagnosis of stage four pancreatic cancer several years later was another blow. But even in this, George managed to find a silver lining. “If I’m going to die of cancer, anyway, does that mean I can stop worrying about my cholesterol?” he asked his doctor. After his doctor gave him the green light, George turned to me and said, “Let’s go home and have a meal to end all meals. I want jumbo shrimp with cocktail sauce, Caesar salad heavy on the dressing, croutons, cheese and anchovies, filet mignon with Béarnaise sauce, asparagus with Hollandaise sauce, baked potatoes stuffed with bacon bits and cream cheese and…” Here George paused and half-closed his eyes, as if imagining the treats that awaited him. I was more than happy to oblige. Declaring the kitchen off limits, I set out to prepare what some have called the Big Mac of desserts, which also happened to be George’s all-time favorite: chocolate lava cake. And not just any lava cake. A man with George’s gargantuan appetite deserved better than that. I not only quadrupled the recipe, but poured the batter into one big mold instead of those silly little custard cups you’re supposed to use. This made it trickier to get the cake out of the pan, but the extra effort was worth it. Topped with chocolate sauce and generous dollops of vanilla ice cream, my giant lava cake was an epicure’s dream: mouth-watering walls of dark chocolate surrounding a warm, gooey center. Loving hands had made it, and a loving palate consumed it. Our feast was indeed a meal to end all meals—for George, that is. He went to bed with a full stomach and a satisfied smile, and died sometime during the night. I missed him terribly, but took comfort in the knowledge he’d died happy. George had grown children. Because his son was a prosperous lawyer, and his daughter married to a wealthy man, he decided they no longer needed financial help from him. So he left everything to me. “Well, even if that’s not the case, you should plan ahead.” Without skipping a beat, he went on to suggest that he set up a battery of trusts, whereby the money I’d inherited from his father and anything else I cared to bequeath would go to him and his sister upon my death. He also pushed for a living will, a health care proxy, and various powers of attorney, all of which I should entrust solely to him. And think I have, long and hard—but not about trusts or proxies or powers of attorney. Instead, my mind has strayed in another direction—to special recipes. My predatory stepson fanatically pursues the Paleo Diet, while his sister is an insufferably smug hyper-vegan. Surely there is something that will tempt even their picky palates. Hmm. A tall order for sure, but I feel up to it.